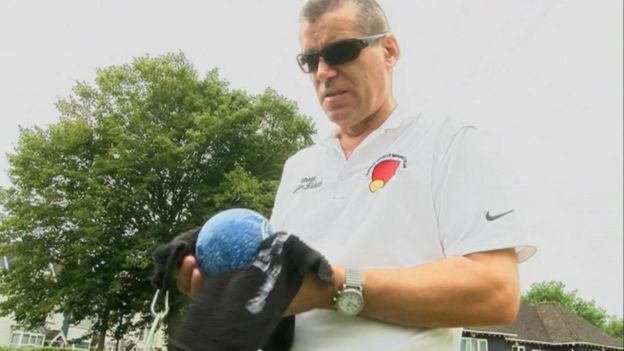 A Llanelli man who went blind overnight has set up a bowls club for those with sight loss, after he was hit by depression and isolation. Stephen Ricketts woke up having lost his sight the morning after he had left work with a headache. “There are no words to describe it – it’s just, the world had gone dark,” he said. Charity RNIB Cymru has said more needs to be done to tackle the loneliness suffered by blind people. Mr Ricketts, aged 50 when he lost his sight, said it led him to become depressed as well as isolated from his friends because he felt uncomfortable talking about his new disability.”It got quite intense,” he said. “Depression soon set in and I said to my wife, ‘go on, divorce me please and find a complete man’. He set up a bowls club for the visually impaired to make friends and help others in his community, using his savings to hire equipment and the use of facilities. “It’s a really nice feeling to walk through the local town and be recognised,” he said. Faye Jones, from Holyhead, also lost her sight, aged 62 and said it was “like a bereavement”. “Because you know it’s something that you’re never going to get back,” she said. Now however, she has set up groups across North Wales to bring people with sight loss together. “There’s two or three of them who have never been to a group before,” she said. “It has been a new beginning for them because they can ring up each other. £3 million Funding in Parkrun! We’ll collaborate with parkrun for three years to support the creation of 200 new events across England. The AAA has a fund which is able to support English Athletes under the age of 23 who are in full-time education and active in athletics. Applicants should not be receiving other funding and be eligible to compete for England. Registered charity Athletics for the Young offer financial help to young athletes and aim to spread their money widely to as many as possible so athletes receiving help elsewhere will not usually be granted an award. The charity are particularly interested in helping genuine hardship cases for promising young athletes. Over recent years, it has been the policy of the Charity to award small grants of the order of £50 to £200. It is possible to apply for funds for costs including equipment and travel. Applications close 10 February 2019 and successful applicants will be contacted by the end of April. The Amateur Athletic Association (AAA) works in a wide variety of areas providing open forums for discussion and organising events and competitions to help with the development of young athletes. The AAA has also taken on the role of safeguarding the history of the sport and awards its historic and valuable trophies to elite athletes. Every year the AAA supports events across the country for young athletes with the aim of using these initiatives to build enthusiasm and to help in the development of young athletes. There are 4 Tom Pink Relay (a multi disciplinary event for U13s) meetings in England and the Simultaneous Marathon (where 11 -13s working in teams complete a marathon; each child running 200m stints) event. The AAA are also involved and have supported training days, workshops and materials for teachers and coaches working with younger athletes. The AAA work with England Athletics to promote and organise relay competitions for schools and clubs to increase participation and encourage more athletes to try relays and improve technique. The long term aim is to improve the British performance in relay events. The AAAs meet regularly and it is an open forum for discussion between the 3 areas, North, Midlands and South about every aspect of the athletics scene with contributions from representatives of Cross Country, Road Running and from independent representatives within the sport. The AAA also support the “Standards” by awarding badges and certificates to youngsters who’ve achieved standards in their discipline. We support the work of AAA Charity for the Young, which has its own board of trustees, giving small grants to young athletes helping them in the early stages of their careers. In 2007 the AAA received a generous bequest from the late Alice and Lewis Pink, to fund children’s activities in memory of their son who was tragically killed in an accident in the early 1970’s. After discussions with the Pink family, the AAA agreed to use the money to fund a series of children’s events in support of and leading up to the 2012 Olympic Games in London. The event is supported by England Athletics and local Athletics Associations. Relay races include trying to beat the times of some of our great distance runners with “Keeping up with Paula”, “Chasing Kelly” and “Chasing Steve.” On the field, Sportshall activities such as weight throw for height, caber toss, shot put, standing log and triple jump, highland steps and soft javelin are performed. The Amateur Athletic Association believes the Tom Pink Relays provide a very important introduction for youngsters to be involved in competition at an early stage of their lives. The Tom Pink initiative, has brought much fun and enjoyment already to over 4,000 children and the popularity of the event goes from strength to strength. A downloadable version of the Athletics for the Young Grant Application is available on the right hand side of this page. It is possible to apply for funds for costs including equipment and travel. Applications close each year in February (successful applicants will be contacted shortly afterwards). With the advent of databases of performances it has been decided to completely revise the standards tables every two years and to introduce standards for events which appear in the Power of 10 database. The method of revising the tables has been to look at the total number of performances recorded in the database and to try to pitch the standards such that the top 7.5% of performances would attain a grade 1 standard; the top 15% of performances a grade 2 standard; the top 30% a grade 3 standard; the top 65% a grade 4 standard. Some events have not been included due to there being insufficient data on which to base a realistic standard, i.e. performances by less than 50 individuals. The Standards for Senior athletes are for guidance only as there are no badges available for that age group. The Standards set for all field events in each age group are based on the use of the implement weights and specifications as detailed under UK Athletics Rules. Standards may be obtained for ALL Indoor Events additional to the 60m and 60m Hurdles using the relevant outdoor tables. Standards may be obtained in each or every single event contained within any Combined Event competition. Sarah Bell is a research fellow at the university of Exeter and she’s recently looked at how people with sight loss benefit from interacting with nature, and the challenges they experience in being able to do that. Sarah is speaking to Connect Radio’s Red Szell. A study exploring the diverse sensory experiences people have with nature. Over a two-year period this project is exploring how people feel in natural environments and asking why they experience nature in different ways. It is examining how these interactions might also affect people’s sense of wellbeing over time.